Inaugurating a symposium on prayer, faith, meditation and healing, Prof. B.M. Hegde, Chairman Bhartiya Vidya Bhawan, Mangalore Kendra said that every hospital should have a prayer room where people from every religion can pray. 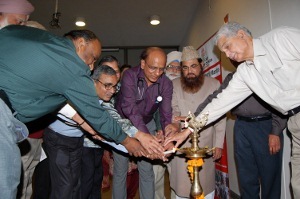 The symposium was organised by Heart Care Foundation of India jointly with Bhartiya Vidya Bhawan at Bhawan’s Auditorium and was participated by speakers from various religions. Moderating the session, Padma Shri & Dr. BC Roy National Awardee, Dr. KK Aggarwal, President Heart Care Foundation of India said that often doctors get request from the patients and relations either to let them pray or have the doctors pray for them or with them. There are studies which show that prayer has a positive healing effect. Dr. Aggarwal said that both prayer and meditation shifts one from sympathetic to parasympathetic mode and helps in healing. Positive faith in doctors and drugs also has a healing effect. In a joint statement Mr. Ashok Pradhan, Mr. G C Garekhan, Mr. J Veeraraghavanfrom Bhartiya Vidya Bhawan said that spiritually religions and cultural beliefs always play significant role in the lives of patients who are seriously ill and dying. They said that the wishes of the dying patients and their relations should be respected and their spiritual needs must be taken care of. On the subject of praying with the patients Rev. Ivan Moses said that in Christianity dying patient’s request for the healthcare professional to pray with him or her is usually honoured. If the doctor is uncomfortable with the request to pray with the patient, he or she can sit by in silence as the patient prays in the patient’s language and tradition. Maulana Dr. Mufti Mohammad Ahmad said that in Islam doctors may pray for patients and they are encouraged to. Islam also believes that patients should not only pray for themselves but also for other fellow patients. Prof. Sunil Kumar and Dr Nirmal Jit Singh said that in Hinduism and Sikhism there are no specific guidelines issued to physicians praying together with the patients. But both religions believe in prayers when the person is sick.